Danze Reef Brushed Nickel Square Modern 4" Centerset Bathroom Faucet w/ Drain: This Danze Reef Collection Bathroom Sink Faucet is built to last. The highest quality standards are used to precision manufacturer a top of the line fixture. Important features of this 100% BRAND NEW Fixture: Complete Item! Everything necessary for installation is included. Brushed Nickel Modern 4" Centerset Bathroom Faucet - 2 Handle Centerset Reef Collection Lever Handle w/brass drain - Reef styling is architectural with a simple square motif. 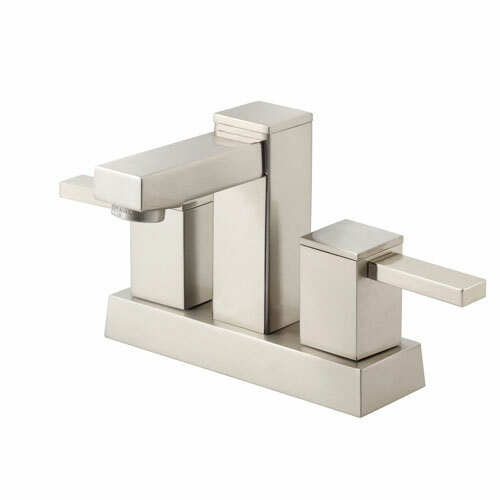 Take our Reef two handle centerset lavatory faucet for example. Elegant, slimming lines are on-trend with today's urban professional. This WaterSense certified lavatory faucet features a crystal clear laminar flow column of water that not only looks wonderful, but feels like no other. - Two handle design for easy water and temperature control - Ceramic Disc Valves provide drip-free shut off for life as well as smooth and easy handle operation. - Brushed Nickel premier finish designed to resist fading and tarnishing. - Metal touch down drain assembly included for easy installation - Watersense certified faucet helps reduce water use - ADA certified handle for universal use - Two (Double) Handle Faucet - Matching Accessories Available - Easy to Install - Installation instructions included. This fixture is manufactured by Danze and is part of their Reef Collection. Reef styling is architectural with a simple square motif. Take our Reef two handle centerset lavatory faucet for example. Elegant, slimming lines are on-trend with today's urban professional. This WaterSense certified lavatory faucet features a crystal clear laminar flow column of water that not only looks wonderful, but feels like no other.